After the killing of Osama bin Laden, Fox News has been hard at work to try and prevent the president from gaining any kind of popularity in the polls by pushing a narrative that he was egotistical, taking a "victory lap." The article by Chris Stirewalt insists that operating off of a post-Osama bump, the president is trying to "tout his administration’s efforts to deal with crime caused by illegal immigrants and to enhance border security," as well as campaign to help raise money for his campaign. This visit is designed to provide cover in advance of a larger effort to push Republicans into a corner on illegal immigration. It will be hard to convince moderate Senate Democrats that advancing an immigration bill right before an election would be a good idea, but if Obama uses his bin Laden mojo to show he is tough on border security he might convince his party that the upside of hurting Republicans is worth the risk. If Obama cannot just take 70 percent of the Hispanic vote next year but also drive high Hispanic turnout by having a hot immigration debate, he will help himself to Latino population centers like Nevada, Colorado, Florida, Virginia and North Carolina. Given that the president’s post-kill bounce was limited and already seems to be leveling off, it looks unlikely that he will have the clout to do anything close to comprehensive immigration legislation, but he may have enough juice to use the issue to harm Republicans. 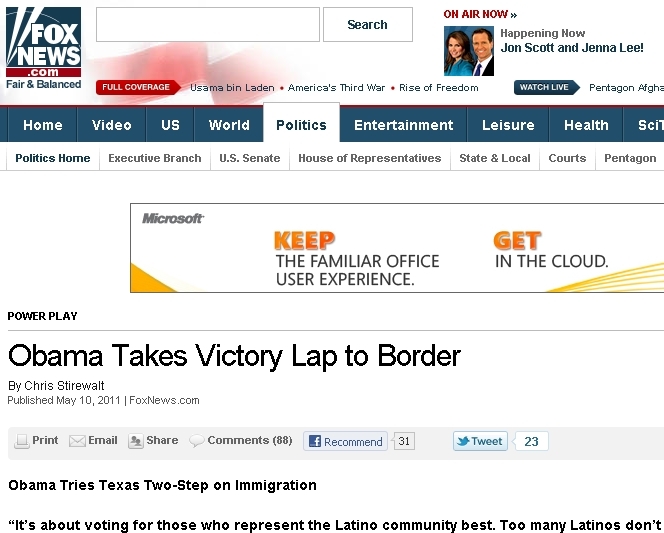 Are we going to see these "victory lap" stories up until the 2012 election?